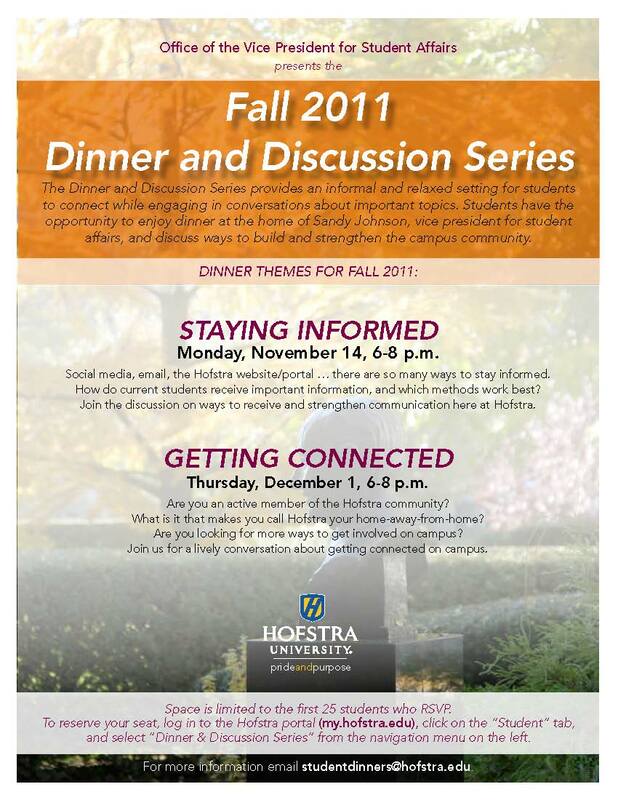 Since the Fall of 2006, I have invited students to my home to share a meal and discuss important topics of interest to Hofstra, higher education, and the world in which we live, in a relaxed and informal setting. To date, over 900 students have participated in one or more of the Dinner & Discussion programs. Last week, the invitation went out for the two programs scheduled for the Fall 2011 term. In less than 12 hours we had to close the guest list because we had reached the limit of my living room! Social media, email, the Hofstra website/portal… there are so many ways to stay informed. How do current students receive important information, and which methods work best? 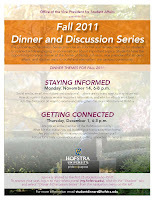 Join the discussion on ways to receive and strengthen communication here at Hofstra. Are you an active member of the Hofstra community? What is it that makes you call Hofstra your home-away-from-home? Are you looking for more ways to get involved on campus? Join us in a lively conversation about getting connected on campus. More importantly—keep on an eye out on your email for the subject line D&D for the Spring 2012 term—you will want to hit reply fast! Labels: connection, Dinner and Discussion, social media, student life.